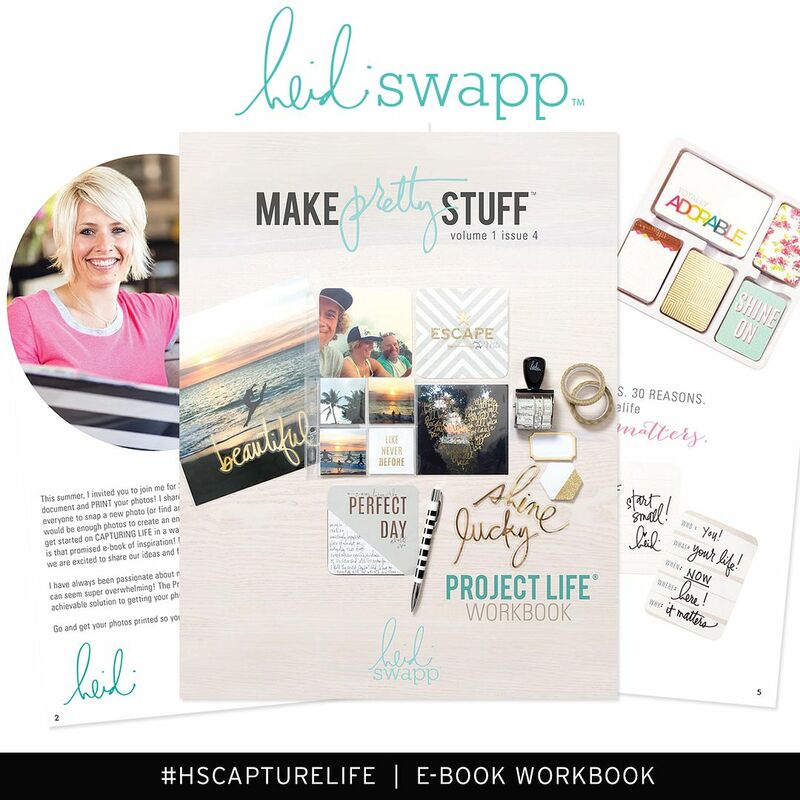 i used the brand new clear pop heidi swapp memory file. 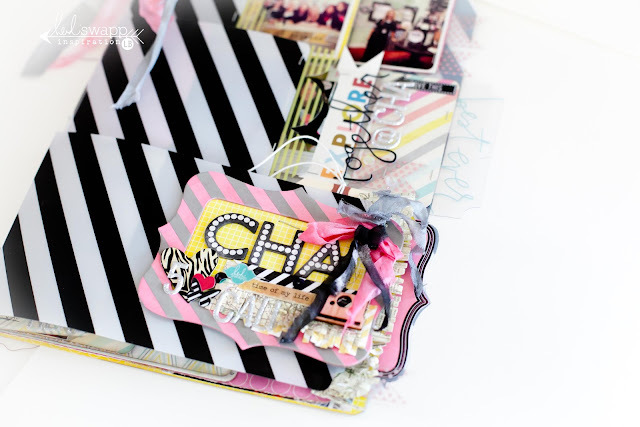 i could sit here and name you a MILLION reasons why i LOVE these files so much...but number one is the COLOR! hello black and white. you are classic. you are contemporary. you are basic. you are AWESOME. 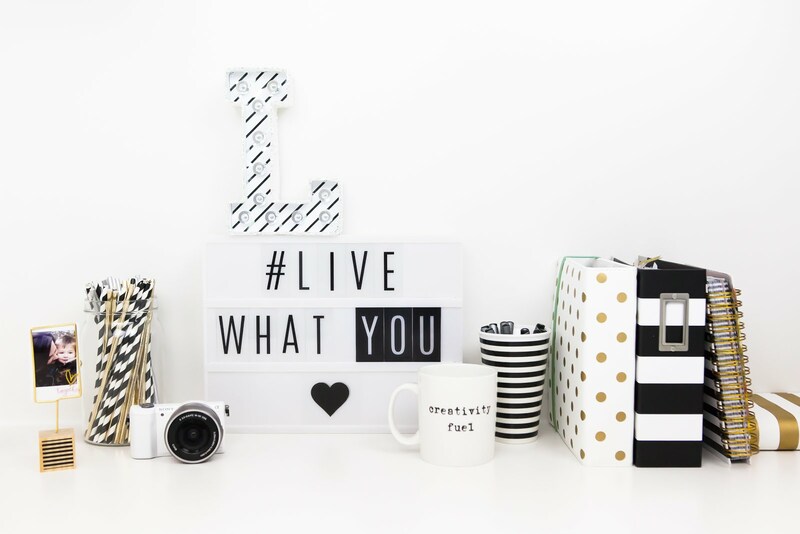 right beside my love affair with glitter and sparkle, is this next love: black and white stripes. so so gorgeous! one thing about me, is that i always love to look at a product and see if there is another way to use it other than the way it was intended. i do not know why i do this, but i know it has become a consistent habit for me. it is very apparent with this file. instead of using it as is, i decided to cut the front cover of it into 3 strips. 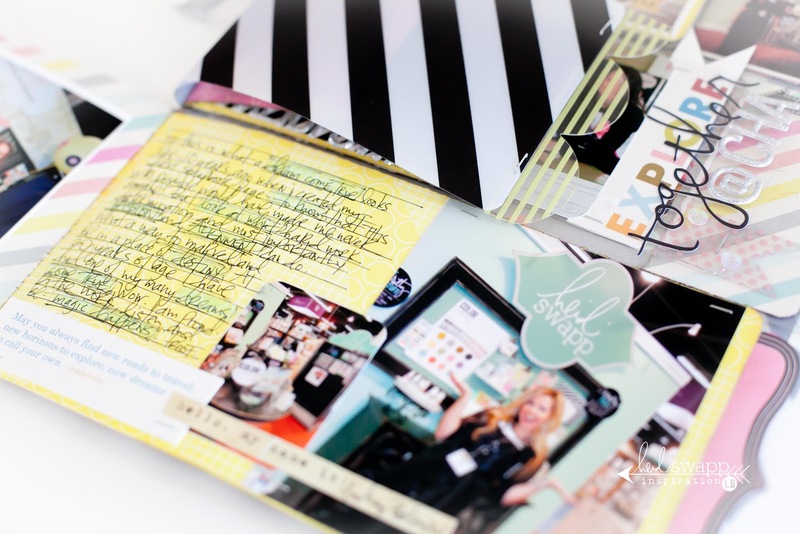 3 interactive flaps that will hold almost like "photo flip" albums and journaling. 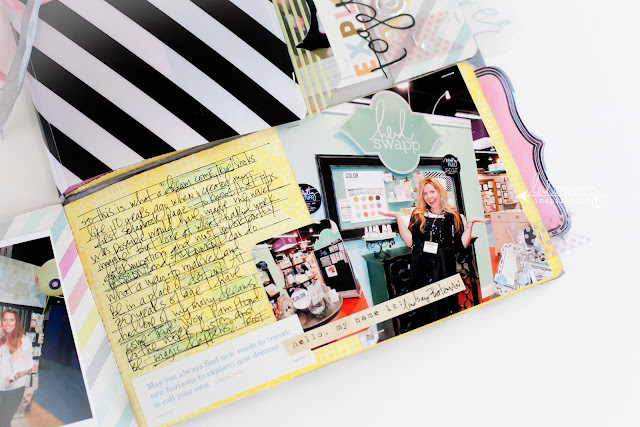 at first i was not sure if what i was doing was going to work (to be honest) but once i started embellishing and journaling i REALLY love the result! 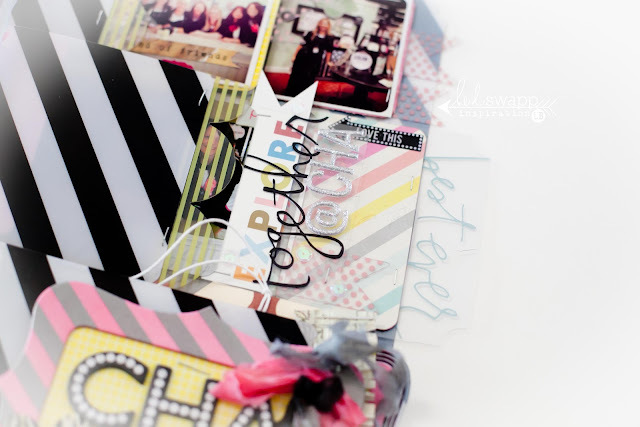 just another fabulous way to take memory files into a whole new level of creativity! 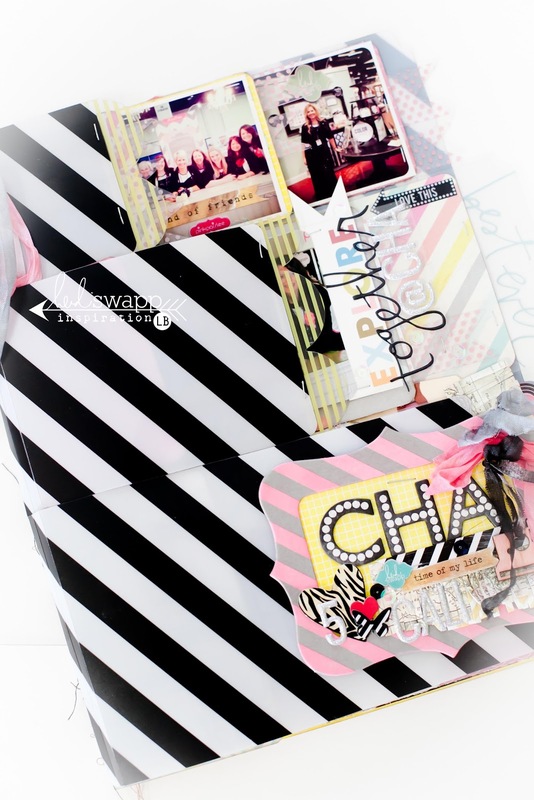 each section on the front cover i embellished with a variety of really FUN elements. the bottom (main flap) i used one of the brand new color pop window frames and sprayed it with primrose color shine. i LOVE this NEW concept of color magic, where the "color" portion acts as the resist and the white space accepts the color shine. it is a whole NEW twist on incorporating colorshine into your projects and it really is amazing. in love...i am AGAIN! wait till you try it...you will L-O-V-E!!! 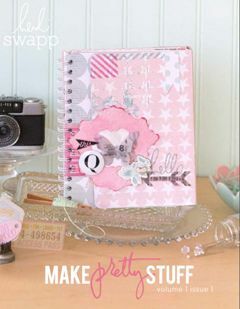 i then placed a piece of the brand new serendipity polka pop paper behind from the NEW serendipity collection. i added color magic chipboard alphas misted with black velvet colorshine, some destination and sunshine trimmings, sentiment stickers, an instaframe heart, a sugar chic stix heart, butterfly sticker from the vintage chic buzz word collection, wood shape camera, and the stunning pink paislee glitter stickers. 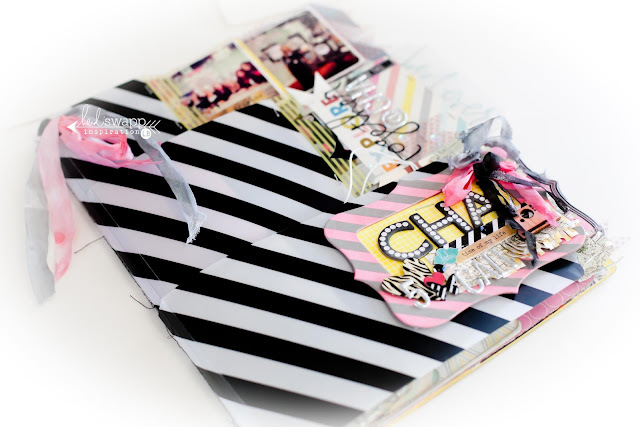 the "heidi swapp" logo and black and white banner i trimmed from my packaging. added to the corner is some seam binding ribbon sprayed with primrose, black velvet and tinsel colorshine. love that trio! 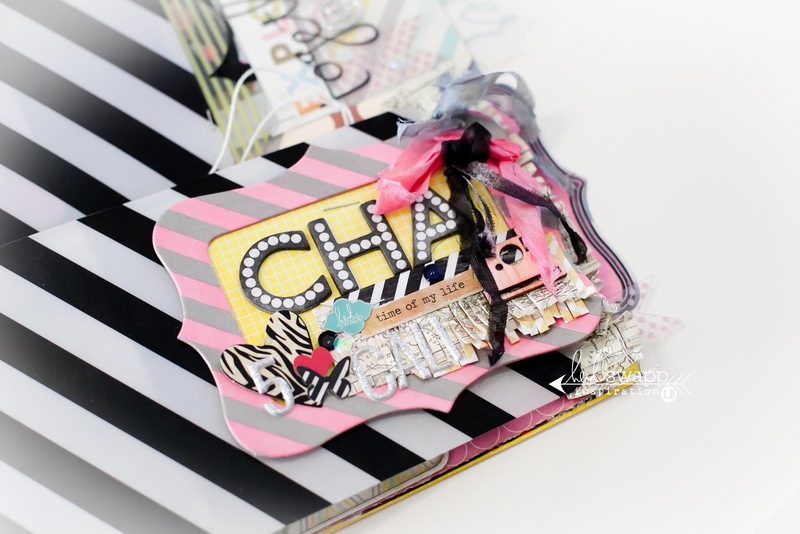 for the middle portion page i added some of the NEW stunning heidi swapp clear pop banner delights, and a clear acrylic piece of packaging where i could label some other embellishments. the "explore" pennant was from a fabulous postcard i received as a gift from my dear friend maggie. i love it and added it as a detail and simply attached with my tiny attacher. i also added one of heidi swapp's new clear pop tabs. seriously these are SO fun. i am in love with layering them! endless possibilities! 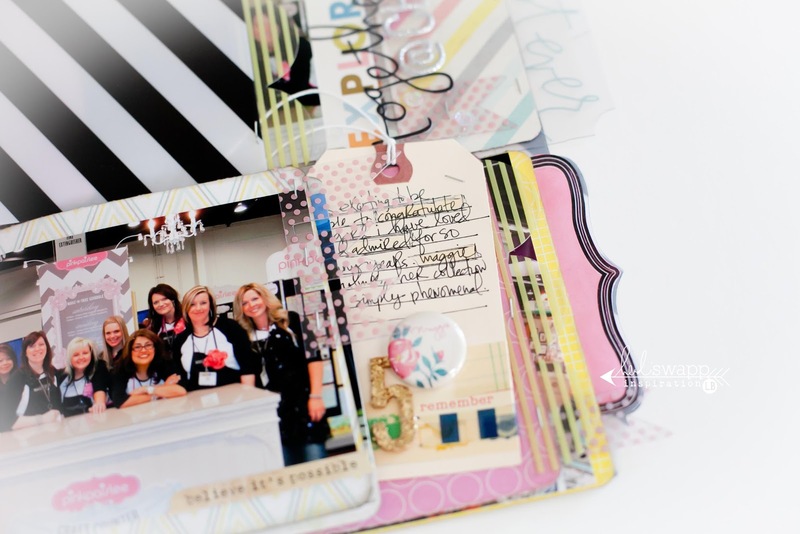 the inside pages of my album showcase the beautiful and stunning new heidi swapp serendipity paper collection. these are AMAZING and will fit an endless amount of themes, stories and moments that you will want to scrapbook. 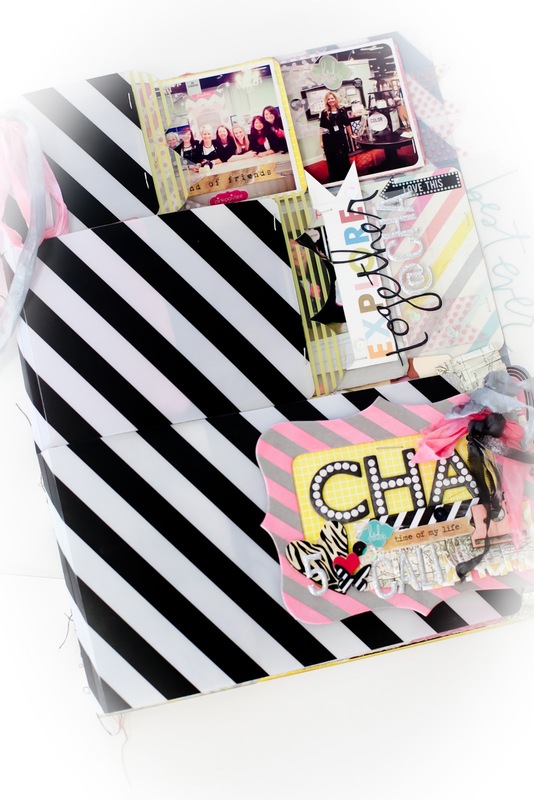 they are the perfect collection for spring, summer, births, birthdays, parties, travel, boy themes, girl themes etc. etc. LOVE the color palette and the designs. truly a beautiful collection. just wait till you see the colors live, they will just make you happy! to create the insides of my flaps, all i did was trim my pages accordingly in random sizes and placed them one inside each other folded. i then used my sewing machine to bind them together and into the acrylic memory file. inside my file i kept things pretty simple with a few sentiment stickers, some clear pop banner delights that i trimmed and some items i collected on my journey from CHA. the tag below was a make and take at maggie holmes booth. 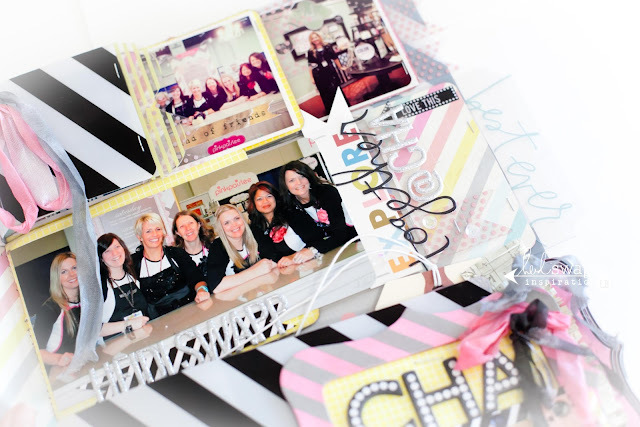 i thought it would be the perfect little journaling card to include in this album along with the photos. 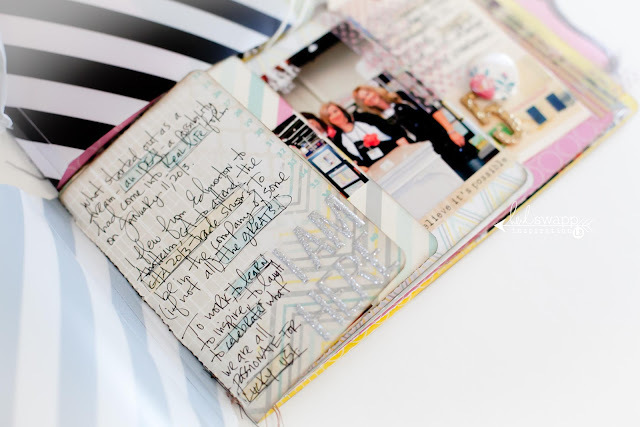 this album is still a work in progress as i think about what exactly i want to say with my journaling. however i have started slowly to document my thoughts and experiences that i had so to never forget what a special time this was for me. here is a full look at the outside front of my memory file. i love how it came together and seriously how DELISH are all those colors together? talk about eye candy! i cannot wait until all of these collections start shipping and showing up in march at your favourite and local scrapbook stores and sites! 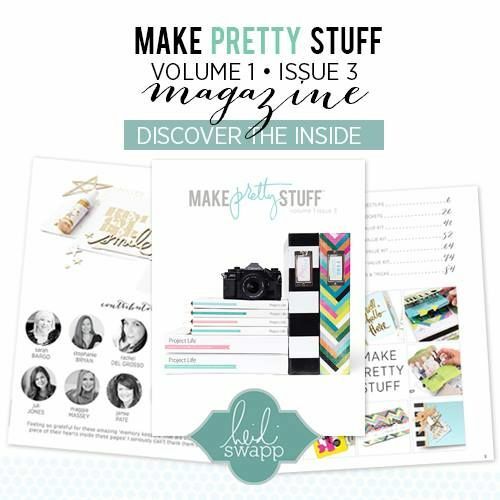 trust me...you will fall in LOVE and want to make SO much pretty stuff! let the countdown BEGIN! Oh, Lindsay...you truly never cease to amaze me. I love how you put this Memory File together...it's so unique, so gorgeous...sooooo, you. And I seriously love how you journal...your handwriting/words/the way everything looks knocks me off my feet...I miss you. Wow Wow Wow!! What a super special project capturing moments that many of us dream about. 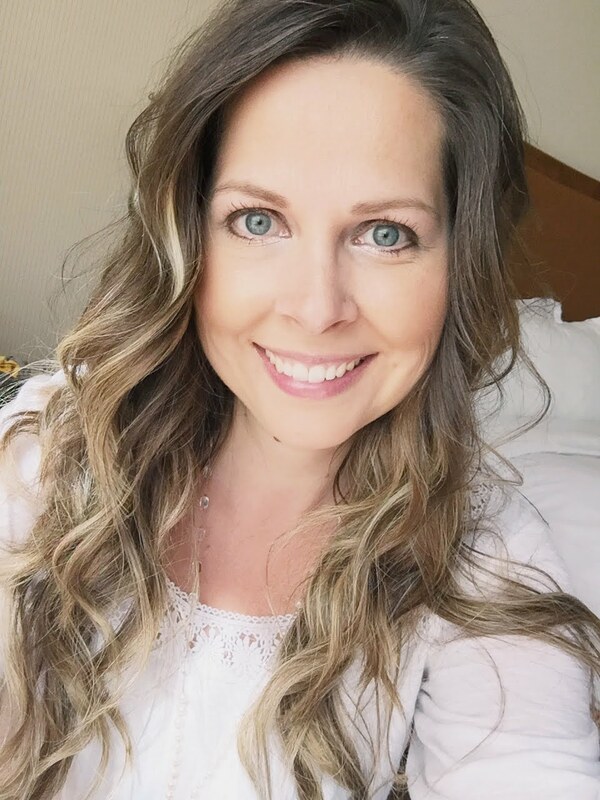 Thanks for sharing lovely Linsday! oh. my. gosh. this is over the top stunning, my dear girl! you rocked this mem file to pieces. amaaaaaaaaazing. to say the least. you have got the creative and innovative fever right now. love seeing it unfold in projects like this. Very cool project ! I can't wait for the new product to hit the stores .. I love the new lines. Ummm...helllooo! I love the 3 different sections. I love the detail and the massive journaling you are so gifted to have. gorgeous!! So amazing!